Venice is such a grand tourist attraction in itself that many visitors venture no further. Or, mistakenly, they are led to believe that there is no point in staying more than a couple of nights or seeing more than the main sights. In fact, there is a lot to see in this region of Italy, the Veneto, and several of its most interesting destinations are within easy reach of Venice, which makes a good base for a wide range of excursions. Firstly, and nearest to Venice, there are the lagoon islands. Heading northwards to Mazzorbo, Burano and Torcello makes at least a half-day trip and is more enjoyable if you take your time. Reading our lagoon islands travel advice should help give you an idea of how to combine islands into enjoyable full-day tours using public transport. Chioggia, a fishing town at the southern end of the lagoon - technically another lagoon island - makes an interesting outing as the journey there is so scenic. 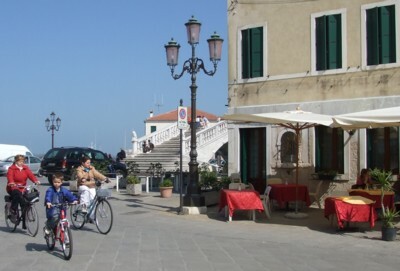 Again, Chioggia can be visited in half a day, but allowing more time will give you a chance to wander and perhaps to appreciate the town's famous fish market and seafood restaurants. Alternatively you can break your journey and explore either the Lido and/or the fishing island of Pellestrina. Read about travelling to Chioggia. Venice may be stuck out in the lagoon, but its rail links are good, with trains heading over the railway bridge towards the mainland every few minutes. Frequent bus services also run from Piazzale Roma, some covering long distances. Both bus and train prices are quite cheap in Italy so making excursions into the Veneto shouldn't make much of a hole in your budget. Treviso is often overlooked by tourists despite having its own budget airport. It's just half an hour from Venice by train, and is a calm, prosperous town with a network of quiet canals, some interesting churches and good art. Padua, a supremely fine art city, is also just half an hour away by train. If you want to see the Giotto paintings in the Cappella degli Scrovegni, you should make plans and book ahead. 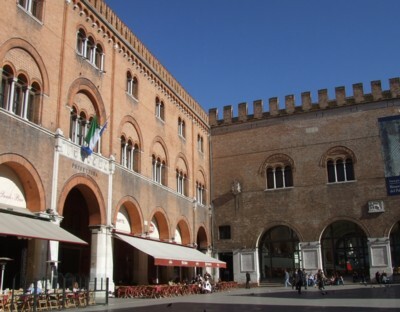 One of our favourite days out is to Vicenza, an hour away by train. It's a pretty town with a mellow atmosphere, and you can enjoy a pleasant walk between countryside villas and viewpoints. There are famously lovely villas dotting the countryside of the Veneto, and some of these can be appreciated by taking an expensive boat excursion up the Brenta Canal from Venice to Padua. If you'd prefer to save money, the same villas can be reached by taking public bus services from Piazzale Roma. The grandest villa is on the bus route, and has the advantage of large gardens and a historic maze: the Villa Pisani, Strà. For a very different, and less cultural, experience, beach-lovers can take a day trip to one of the Veneto's seaside resorts, such as Lido di Jesolo, north of the lagoon. Further north you come to the Friuli-Venezia Giulia region; some of the region's sites, including the ruins of Roman Aquileia, can be visited as a day trip from Venice but the train journey will take a couple of hours. For a more unusual day trip, you could head to one of the quiet smaller towns of the Veneto region, like the fortified towns Castelfranco Veneto and Cittadella. Monselice is a picturesque little town with a castle and a fortress on a hill, and the nearby Euganean hills offer pleasant views and footpaths. Browsing our Veneto section will give you some ideas of the destinations which can be reached from Venice, along with travel information. > Find and book Venice tours and activities with Viator.